Geneva has a long history of horology. Clocks were known there in the ninth century, probably imported from southern Germany, and were quite common by the eleventh century. The making of watches came to Switzerland in the 16th century, in 1587, when it was introduced to Geneva by Charles Cusin of Autun, Burgundy. Sales of watches received a considerable boost when Calvinist reforms banned the wearing jewellery and goldsmiths offered decorative watches as an alternative. A hundred years later there were over 100 watchmakers registered in Geneva, who employed more than 300 workmen and manufactured nearly 5,000 watches a year. In 1601 the Watchmakers Guild of Geneva of Geneva was established to control the trade in and around Geneva. The guild ensured that the quality of watches made by its members was maintained at the highest levels, but also restricted practices that could have increased the numbers made and reduced the cost of watches. Mass production was banned, the number of apprentices kept artificially low, and entry to the guild (and thus permission to make watches) strictly controlled. As a result of this, the reputation of Geneva watches for quality was kept high, as were the prices. This continued until the later half of the 17th century in Switzerland when Daniel JeanRichard, a man who was not prepared to go along with the accepted order of things, changed everything. JeanRichard started watchmaking in the Jura mountains, giving employment to local farmers who could not work outdoors during the long winter months. The industry grew rapidly during the eighteenth century. 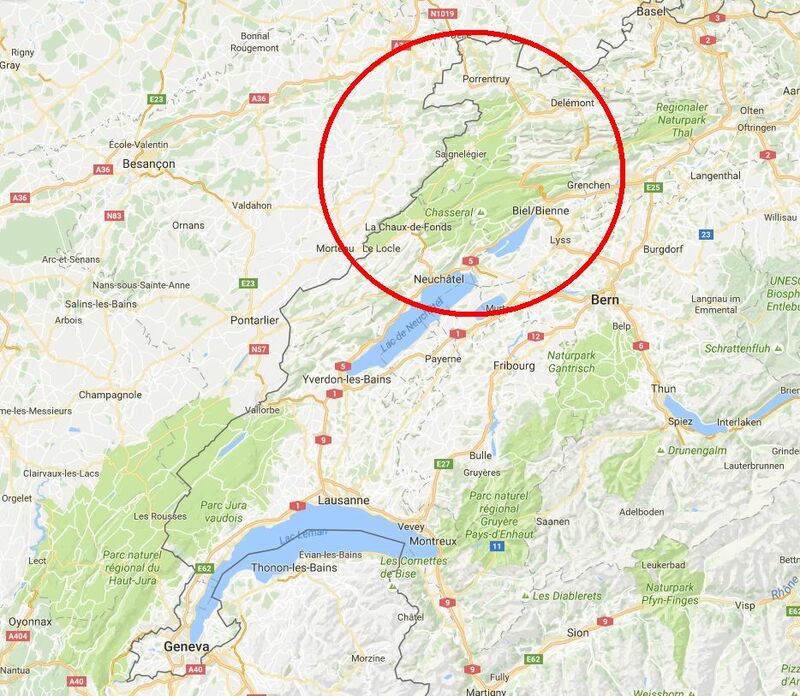 In the nineteenth and twentieth centuries almost every Swiss watch was made in Le Locle and La Chaux-de-Fonds or the surrounding areas, gradually expanding North and East towards Biel/Bienne. In the sixteenth century the first watchmakers were located in Southern Germany, then France and Geneva; areas with wealthy princes, aristocrats and merchants who were prepared to pay a high price for an item they could show off to their peers. Before the invention of the balance spring watches were poor timekeepers and were more curiosities, made of precious metals and richly decorated. The manufacture of small numbers of very expensive watches by members of the restrictive watchmakers guilds was hardly an industry. Towards the end of the seventeenth century, Daniel JeanRichard began watchmaking outside of Geneva, away from the control of the guilds that had kept production of watches to small numbers. Daniel JeanRichard was born in 1672 in Les Bressels, La Sagne, half way between Le Locle and La Chaux-de-Fonds in what is now the Swiss canton of Neuchâtel. This area is in the Jura mountains, high above the town and lake of Neuchâtel, far removed from the then Swiss watchmaking centre of Geneva. Geneva itself is 373.6 meters (1225.7 ft) above sea level, already high enough. Neuchâtel is higher at 430 m (1,411 ft), but Le Locle is 945 m (3,100 ft) above sea level, much higher still. Due to the altitude and the lack of water, with porous limestone underground, the land around Le Locle is poorly suited to farming, and the area is often snow bound in the winter, so the inhabitants of this region were always on the look out for work that they could do indoors during the cold winter months. Some records give JeanRichard's birth year as 1665, but Jaquet and Chapuis refer to documentary evidence from local archives which shows that it was 1672. The ancestors of the family JeanRichard were called Richard, but one of them had been given the christian name Jean and for some reason this was carried forward as the unusual double second name JeanRichard during the following centuries. Little is known of Daniel JeanRichard's background. There are suggestions that he was a blacksmith or a locksmith, and Kathleen Pritchard, in " Swiss Timepiece Makers 1775-1975" says he was "probably" a goldsmith. It is known that there were watches in Le Locle before JeanRichard was born, and also that there were goldsmiths working in the mountains. But it is Daniel JeanRichard who is credited with bringing watchmaking to the region, beginning a revolution that would turn a rural farming community, struggling against poor soils and long hard winters, into the watch making centre of the world. It is a remarkable story. The first recorded mention of Daniel JeanRichard is by the banneret Frédéric Samuel Osterwald who, in 1766 published a description of the mountains and valleys of the Principality of Neuchâtel and Valangin. In this book Osterwald says that "a man named Peter, a horse dealer, returning to his homeland in 1679, brought with him a watch made in London, an item absolutely unknown in the mountains." The watch had become broken and the dealer, noting the aptitude of the young Daniel JeanRichard with mechanical things, asked him to repair it. JeanRichard took the watch apart and repaired it, making notes and drawings of the parts in the process. Based on these notes and drawings, JeanRichard proceeded to make a replica of the watch. But first he had to make the tools he needed, taking a year in the process. He learned that in Geneva the watchmakers had machines for dividing wheels equally and cutting the teeth. He went to Geneva, but the guild watchmakers kept the machines secret. Returning home in frustration, he reinvented the machine himself. Once he had made all the tools he needed, it took him a further six months to make his first watch. Although there might be some truth in this charming story, the story of the horse dealer and the broken watch is probably legend and similar tales are told in watch making areas of France and Germany. What is known is that 1691 at the age of 19, Daniel JeanRichard opened a watch workshop near Le Locle, and proceeded to revolutionize the watch industry. He defied the restrictions of the guild system and employed local farmers, who had little work during the long winters, to manufacture individual components for him, which he would assemble into watches. This system of division of labour was called établissage and the person who sat at the centre of the web and controlled it all was called the établisseur. Businesses of this type were called comptoirs. JeanRichard taught the farmers to specialise in making certain parts, so that with experience they could produce high quality individual parts very cheaply compared to the guild system, where a few craftsmen made all the parts of a watch. He also increasingly mechanized watchmaking, designing and improving tools and machines so that less skilled workers could still produce high quality parts. This system of increasing specialisation and mechanisation produced high quality watches at low prices. After setting up his workshop in Le Locle, Daniel JeanRichard first taught horology to his five sons, and then other young people curious to learn took up apprenticeships with him and became masters, who in their turn trained new artists. Without the restrictions on the number of apprentices that the Geneva watchmakers had, the number of apprentices and new masters grew rapidly in the mountains. From its introduction to Le Locle by Daniel JeanRichard, watchmaking spread all over the Jura range of Neuchâtel and Berne and the adjoining districts of Soleure and Bâle. When Osterwald recorded his journal in 1766 he noted that "at least 15,000 silver or gold watches were made each year in Le Locle and La Chaux-de-Fond collectively, without counting a very great number of simple and complicated clocks." By 1855 the watchmakers in the Jura mountains were producing nine times as many watches as those of Geneva. The Kelly Directory of 1901 lists 713 Swiss watchmakers. Of this 713, 258 are located in La Chaux-de-Fonds, 37 in Le Locle, 88 in Bienne and 47 in Tramelan, a total of 430 compared to just 75 in Geneva. A clear indication of how the descendants of the farmers in the mountains had overtaken the guildsmen on the shores of Lake Geneva. At the beginning of the 20th century, more than a half of all watches distributed around the globe were produced in the region of Le Locle and La Chaux-de-Fond. Daniel JeanRichard died in 1741, but he is still hailed as a hero in Le Locle and La Chaux-de-Fonds. In the center of Le Locle, in front of the post office, is a statue of him in a workers apron, examining a watch. There is a Daniel JeanRichard museum in La Sagne, and a street is named after him in La Chaux-de-Fonds. 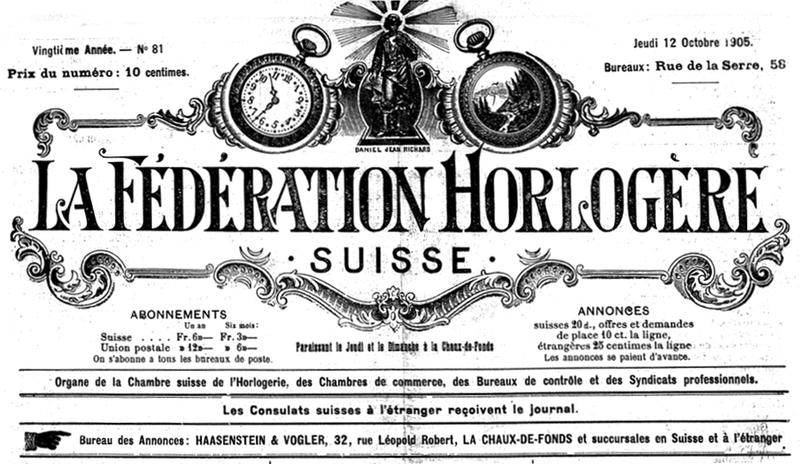 The picture below is the banner from the front page of La Horlogère Suisse, a trade paper published in La Chaux-de-Fonds. At the top, in the centre, is a picture of the local hero; Daniel JeanRichard. The seat of the French watchmaking industry was in Besançon, not Paris. Watchmaking was first introduced in Besançon in 1793 by a few religious or political fugitives from the watch manufacturing districts of Switzerland. The introduction met with numerous obstacles. In 1794 364 gold and 9,106 silver watches were submitted for hallmarking and the trade continued at a low level. In 1842 the local population awoke to the opportunity offered them and from that time the watch trade made rapid progress. In 1877 Besançon turned out a million and a half of watch, and half a million clock, movements. In Besançon, out of a population of about fifty thousand, from fifteen to sixteen thousand were employed in horological pursuits. About forty thousand more gained a living by the same kind of work in other parts of the Departement Du Doubs, of which Besançon is the centre.